Why is this project called THE SHORE you may ask, since it is not exactly near the beach? Well, this is because the swimming pools on the ground level actually have real sand around them and sand also covers the bottom of the pools as well. This allows residents to enjoy the senses of beautiful shores right at their doorsteps. But what intrigued the wife and I most about THE SHORE is not the sandy “beaches” and pools, rather the fact that this is one of the rare projects that has no bay windows or planter boxes in each apartment unit. So we finally decided to pay a visit to the sales gallery at lunch yesterday to check out the showflats. The SHORE is located at the corner of Mountbatten and Amber Road, where the former Rose Garden used to be. The entrance to the sales gallery (and also where the main entrance to THE SHORE will be located) is along Amber Road, after the right turn from Mountbatten/Amber Road junction. THE SHORE (or The Shore Residences) is a 408-units condo project consisting of 6 towers of 20-storey each. It is built on a 191,000sqft L-shaped site and has a plot ratio of 2.1. As some of you may recall, this is one of the two developments (the other being The Greenwood) that Far East has decided to sell on a 103-years lease although the land is freehold. The expected TOP of THE SHORE is December 2013. The facilities in THE SHORE centre on the “sandy” swimming pools fronting the four towers on the ground level. So you can expect things like spa pool and pavilions, lagoon pools, BBQ cabanas, “Shore Bungalows” – which are like club houses with dining facilities, and even a strip of sandy beach. The 409 carpark lots are found within an L-shaped carpark podium that is 5-storey high, located behind the towers. In other words, you get a multi-storey carpark in this project with just about enough carpark lots for each apartment unit. And given the apparent lack of public parking around the development, your visitors are better advised to take public transportation to save them from the frustration of having to hunt for parking spaces. More facilities are available on the rooftop of the carpark podium - a 50m lap pool (normal with no sand), “Cliff Villa” and Garden Pavilions, more BBQ pavilions, steam rooms, gym and TWO tennis courts. There are 3 types of showflat at the sales gallery. 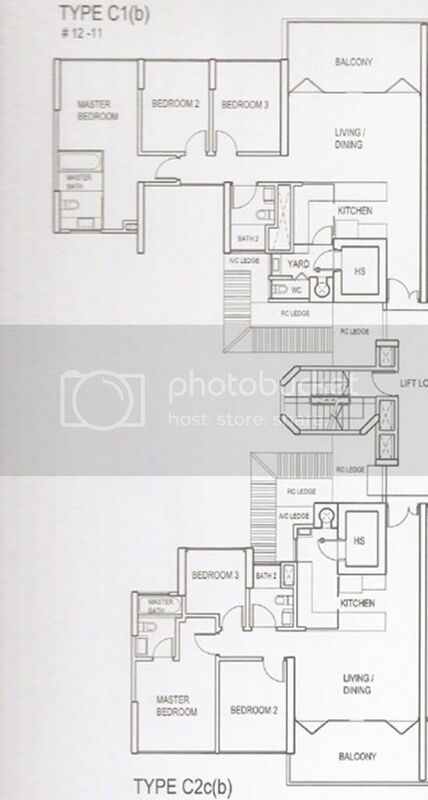 The first is a 1292sqft 3-Bedroom (Regular) unit (Type C1). As you enters the front door, a narrow walkway leads you into the rectangular living/dining room. We were surprised at how small this is, i.e. if you minus off the 100sqft of balcony that has been “marbled” up to conjure the impression of a much bigger living/dining area. But you can technically do the sdame, since the balcony doors are those that you can “fold and tuck”’ towards the sides. It comes with 60cm x 30cm marble-slab floor and 2.85m ceiling height. The dry kitchen comes with solid surface top, its own sink and cabinets. This extends to the L-shaped wet-kitchen, which is rather small. Far East has thrown in quite an extensive range of kitchen appliances - you get “Bosch” hood/hob/oven /microwaves/coffee maker/2-door fridge, a small “Vintec” wine-fridge and even a sophisticated looking set of dish drying rack on top of the kitchen sink. There is a small yard area with a small wash basin/low cabinet incorporated. The bomb shelter/maid’s room (will fit a single bed and probably nothing else) and toilet are located at the yard. The common bath is quite good size, with marble floor/walls and “Ideal Standard/Newform” bathroom fittings. The pleasant surprise actually comes from the bedrooms – the 2 common bedrooms that are next to each other are very good size for a 1200+sqft apartment. The lack of bay windows actually allows you to maximize the space in each room without having to rack your brains on how to incorporate the bay window ledge into your room design. As such, you get a much bigger room. The wardrobes looked to be of good quality, and it comes up the same UV light panels for moisture adsorption ala Silversea. The master bedroom is big – it is fitted with a “King” bed and still looked very spacious. It also comes with a gorgeous L-shape transparent glass wardrobe, which unfortunately is a tad too small in our opinion. The master bathroom is decent size, and separated from the bedroom by “glass walls” all around. So you can actually admire your partner taking a shower, or a dump, for that matter. You get a long tub, a separate standing shower stall fitted with overhead rain shower, and “Ideal Standard/Newform” bathroom fittings. We especially like the creamy-white marble floor/black marble walls colour combination in the bathroom. • No proper yard to speak of – The bomb shelter/maid’s room is located at the end of the wet kitchen, and there is no additional bathroom here as well. • The common bathroom has marble flooring but only ceramic tiles for the walls. • The common bedrooms are diagonally opposite to each other (instead of adjacent) and one of these is very small. This is because the back of the master bedroom’s wardrobe “sticks” into this room. • The master bedroom is slightly smaller in size, but is still good for a “King” bed. • The master bathroom does not have separate long tub/standing shower. What you get is a long tub with a rain shower fitted on top of it. You will see that the layout for the 1378sqft 4-Bedrooms (Type D2) is almost the same as that for the regular 3-bedder (Type C1). The only difference is that the third common bedroom is located in the "void" next to the common bathroom. 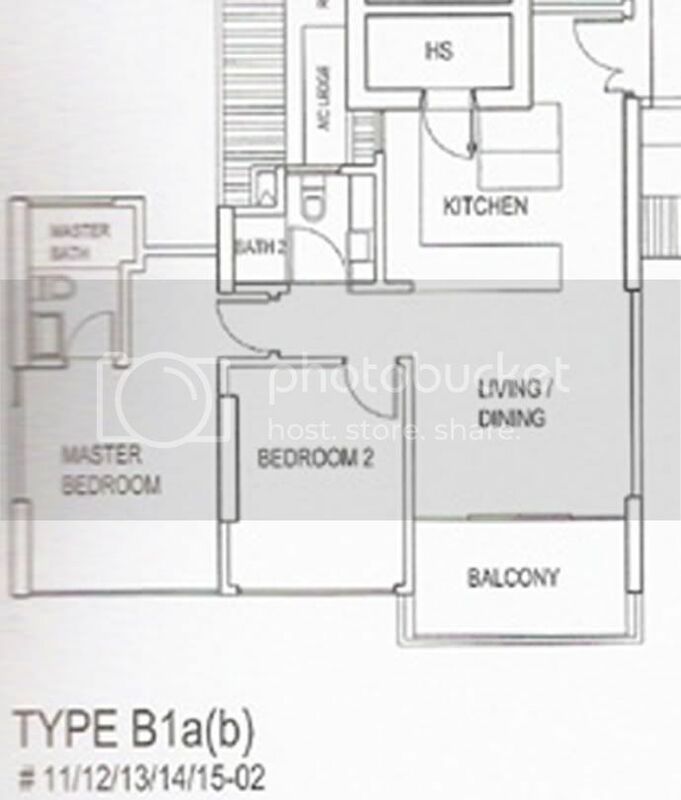 The last showflat is the 883sqft 2-Bedrooms unit (Type B1). This is actually the one that both the wife and I liked best. 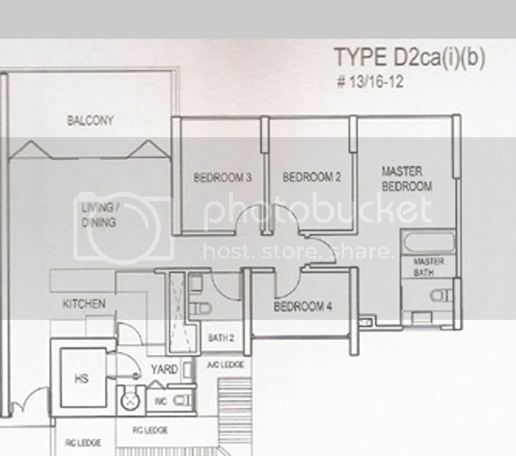 It has a very nice layout that makes the unit felt far more spacious than the tiny 883sqft of space it occupies. Again, this unit comes with almost exact kind of interior furnishings/fittings/kitchen appliances as the other two showflats. It has a small squarish living/dining room and a tiny L-shape wet/dry kitchen combined. The bomb shelter is located at the end of the kitchen, but there is no yard or toilet. Both the common room and bathroom (marble floor/ceramic wall) are surprising good size, while the master bedroom is very spacious and fitted with the same eye pleasing L-shape glass wardrobe - so make sure your clothes are not ugly and neatly stored. The master bathroom has a sunken bath with overhead rain shower. It is amazing the amount of additional space you can get out of your unit just by eliminating these, as demonstrated by the showflats we saw at THE SHORE. Definitely something that the other developers should think about, especially for projects with “mickey mouse” units! • The very functional unit layouts, especially with the 2-bedder, which makes the units feel larger than their actual sizes. • The quality of interior furnishings and fittings provided, which adds an additional level of “class” to the apartments. • The unique “beach by the pool” feature – now you do not have to thread across to East Coast Park for your “sun and sea” fix. We have forgotten to ask if salt-water is used in the pools though. 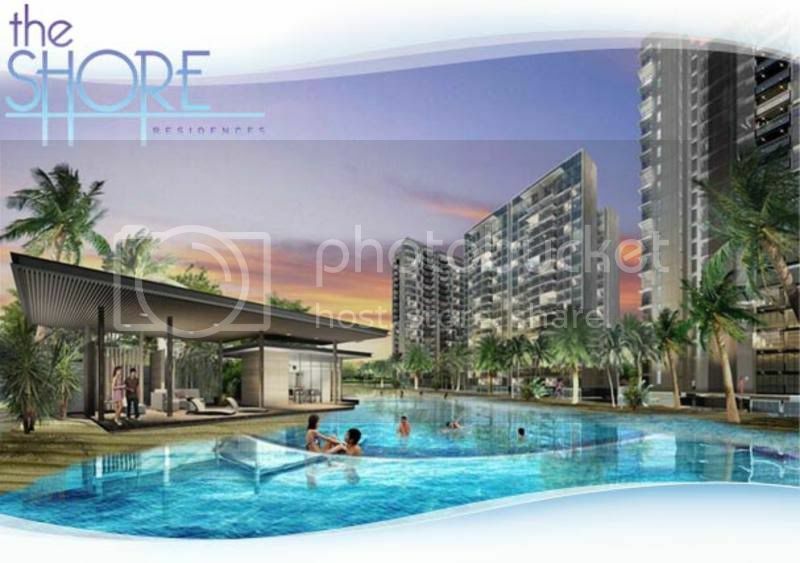 • THE SHORE is relative close to the City/CBD, as well as the upcoming Marina Sands IR. You can also find almost all the amenities you will need at Parkway Parade, which is only minutes’ away by foot. Last but not least, you will be spoilt for choice with the numerous eateries just down the road (i.e. along Katong/Joo Chiat Road). • The living/dining room for the 3-bedder showflats is disproportionately small compared to the bedrooms. The wife and I will prefer a slightly bigger living/dining space since we do entertain from time to time. • The 6 towers are built too close to each other. The distance between Tower B and the adjacent Tower C is only a mere 2 meters apart from each other! Looking at the site plan, we feel this may not be a suitable project for those with claustrophobia. • THE SHORE is likely to be “blocked” on 3 sides – by high-rise apartments (e.g. Esta, Vertis) on the left, Paramount Hotel on the right, and The Seaview Condo at the back. It is only unblocked in the front, given that there are height restrictions imposed on developments across from Mountbatten Road. However, you are met face-on by the ugly Katong Shopping Centre building, which is definitely not a pretty sight. The consolation is that this mall is up for en-bloc sale and thus may not be around by the time THE SHORE is ready for occupation. • If you are familiar with Mountbatten Road, you will know that it is quite a traffic nightmare along this stretch of road especially during rush hours. The situation can only get worse as more new condos (e.g. One Amber) start to come online. • Only one primary school is within 1-km from THE SHORE – Tanjong Katong Primary. This is a very popular primary school and if past history is anything to go by, balloting is still the order of the day for those living within 1-km from the school. The take-up rate for THE SHORE is pretty good. Since its official launch at the start of this year, we estimate (from the big wall chart listing all the units that are sold) that almost 70 – 75% of the launched units have been sold. This includes all the 1-bedders and all but 2 units of the regular 3-bedders. Units in Tower C are not launched yet, and we were told that there will be a price adjustment (upward, of course) from 1st March onward. In summary, the wife and I believe that Far East has finally got it right with THE SHORE by eliminating the bay windows and planter boxes, which in our humble opinion, are just a waste of good space. Buyers who are comfortable with “smaller” units will be pleased with the relatively smaller quantum amount you need to foot for a unit at THE SHORE. And to add the icing on the cake, we were told that it will be at least one year after the first 20% down payment before the next trench of payment is due. However, for those who are thinking of buying a unit for rental, do be forewarned that almost 80% of the smaller 1 and 2-bedders sold thus far are supoosedly bought by investors. So you are likely to face quite a fair bit of competition on the rental front – not just with fellow investors at THE SHORE, but also from the new projects nearby. No Comment to " THE SHORE (Review) "